After teammate Sergey Karasev was crowned 3-point champion, Janis Timma made sure that another All-Star contest will go to a Zenit St. Petersburg player. 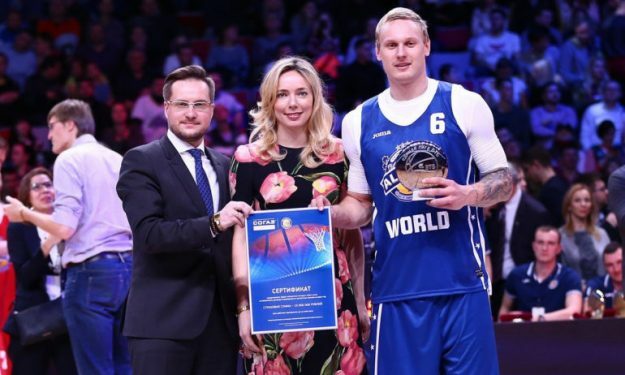 Janis Timma spectacularly passed the ball between his legs mid-air and hammered it in the basket, earning first place in the VTB League All-Star game slam dunk contest. This fantastic jam gave the Latvian player a perfect 50 points (10 by each judge) and allowed him to beat Maxim Kolyunshkin of Avtodor Saratov in the final. Previously they had both gained 97 points to advance in the title matchup, leaving out Enisey center Frank Elegar (3rd with 95 points) and Josh Adams of Avtodor Saratov who had 81. Watch the dunk that made Timma slam dunk king of the first ever VTB League All-Star game!